Me, I love strawberries. Whenever I see those little plastic punnets with strawberries, I spend so much time examining them and finally make a selection. I bring them home and when I pop one into my mouth, the love fizzles away, and is replaced by a feeling of disgust at their tartness. Most of the time, that is. Sometimes, they taste just meh. My sister, who lives in the UK, has a wild strawberry plant growing in a corner of her garden. Not more than an inch in length, those fruits were the prettiest and sweetest strawberries I have ever seen. Or tasted. In Chennai, strawberries are still available in stores but to get a single box of unblemished berries is impossible. 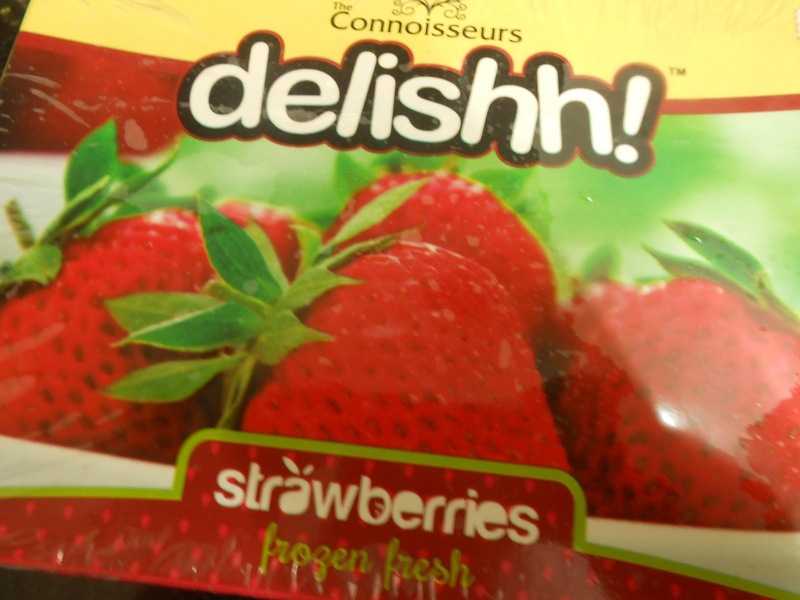 So when I found boxes of frozen strawberries at a store, I couldn't resist buying. I tasted one, though they were from Chile, they were tart!! Whatever did I expect?? The boxes sat in my freezer for a couple of weeks and then finally, a couple of days ago, I got around to making a cheesecake. As cheesecakes go, this one is very simple to make. The usual ingredients for a cheesecake- biscuits and butter, cream cheese, sugar, gelatin and whipped cream. And 2 boxes of strawberries. Why 2 you may ask. Because I wanted a glazed topping. Nowadays, anything that has to be photographed and put in the blog better look pretty. After making the usual biscuit crust, pat it into an 8" tin with a removable base. Leave to chill in the freezer. Mix the strawberries with sugar, warm it, then keep aside for the sugar to draw out the juices. Strain the juice and keep that aside, use a stick blender to coarsely process the strawberry pulp. Ensure the pulp is sweet enough. Sponge the gelatin and mix it into the warm pulp. When completely dissolved, keep aside to cool to room temperature. Whip cream cheese till smooth, mix through the pulp. By some stroke of luck you manage to get really sweet strawberries, mix through a teaspoon of lime juice. (If you use unsweetened cream, remember to whip your cream with sugar.) Gently fold through the whipped cream. Pour over the biscuit base and leave to set. 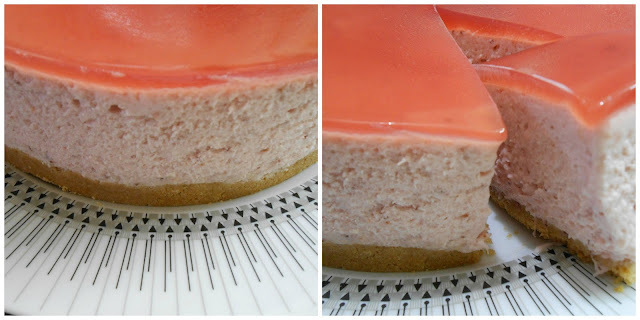 To make the pretty pink glaze, sponge a teaspoon of gelatin, mix through the reserved strawberry juice. Pour it very gently over the set cheesecake, leave to set for another 2 hours. Pulverise the biscuits into crumbs, mix with soft butter and sugar. Press into the base of an 8" pan with a removable base. Leave to chill in the freezer. Thaw the berries if they are frozen, sprinkle sugar over them and place on a double boiler till very warm. Keep aside so the juices get drawn out, strain and keep aside enough for the glaze. Use a stick blender and coarsely process the berries. A few chunks here and there are fine. 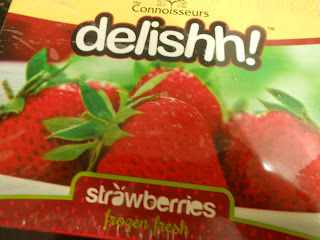 If necessary, warm the strawberry pulp again, dissolve the gelatin in it, cool to room temperature. Whip the cream cheese, fold through the strawberry. Fold in the cream and when well combined, pour over the chilled crust. To make the glaze, warm the sponged gelatin over a double boiler. When it has melted completely, stir into the strawberry juice. Pour very gently over the cold cheesecake. Leave to set for another 2 hours. *If the strawberries are quite sweet, mix a teaspoon of lime juice into the puree. *If the cheesecake mix needs a bit more sugar, add sifted icing sugar.